Love the Sing movie? 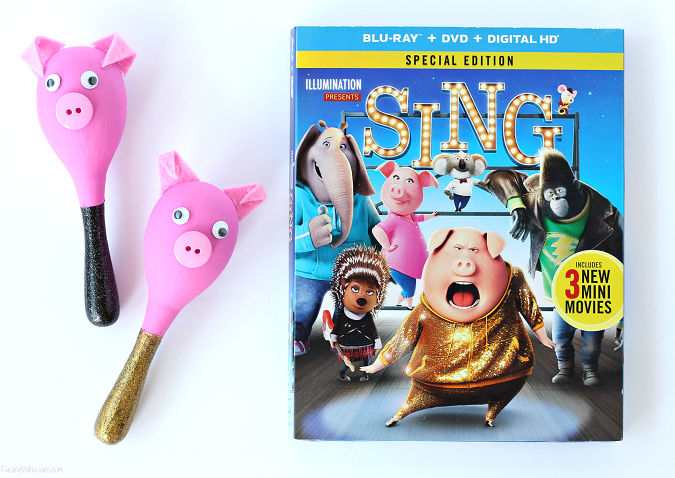 Celebrate SING Special Edition Blu-Ray with this adorable DIY Pig Maracas, and grab your SING Movie Easter Basket Ideas for Preschoolers. This post is in partnership with Universal Pictures Home Entertainment. Every day, we can expect the biggest musical performance of a lifetime. My 4-year old diva is at the age where she just loves to sing and dance. And these days, my little performer just loves to reenact the songs from the fun animated movie, SING. 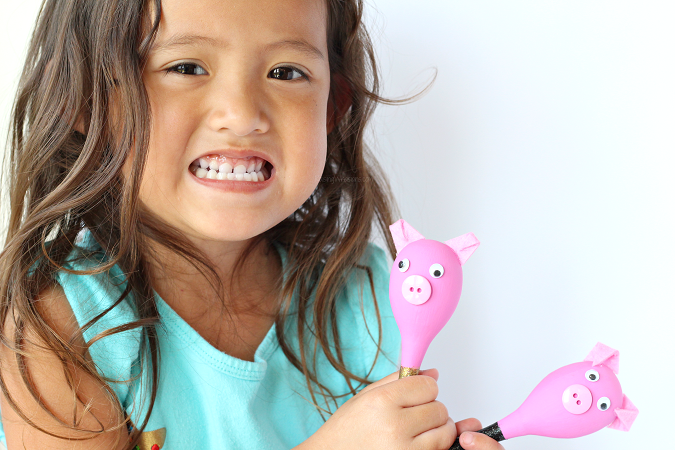 And with Easter right around the corner, I’m encouraging my daughter’s singing spirit with these DIY Pig Maracas and some fun SING movie Easter basket ideas for preschoolers. Celebrate SING Special Edition, now on Blu-Ray just in time for Easter! My kids are so excited that SING Special Edition is now available on Blu-Ray and DVD. It’s not too surprising; SING is a wonderful, funny, heartwarming film with great music and a fantastic cast. But in case you haven’t had a chance to see this animated film, there’s plenty of reasons of why this movie makes a great Easter gift. From Illumination, the studio that brought you The Secret Life of Pets and the Despicable Me franchise, comes an animated comedy about finding the music that lives inside all of us. SING stars Academy Award® winner Matthew McConaughey as Buster Moon, an eternally optimistic koala who puts on the world’s greatest singing competition to save his crumbling theater; Academy Award® winner Reese Witherspoon as Rosita, an overworked and unappreciated mother of 25 piglets desperate to unleash her inner diva; Scarlett Johansson as Ash, a punk rock porcupine with a beautiful voice behind her prickly exterior; Taron Egerton as Johnny, a young gangster gorilla looking to break free of his family’s felonies; as well as Seth MacFarlane, John C. Reilly, and Grammy Award-nominated Tori Kelly. 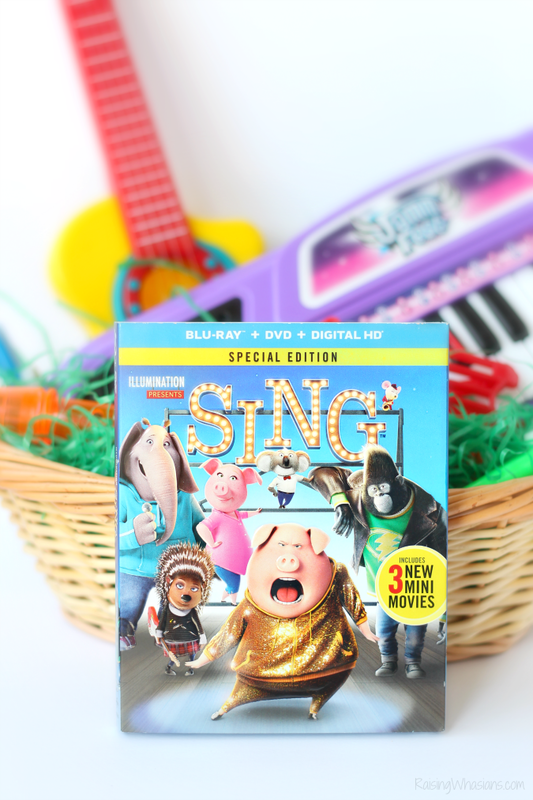 SING Special Edition Blu-Ray makes the perfect Easter basket stuffer for this SING themed Easter basket, with so much more to love than just a great movie. The music-filled comedy will include over 60-minutes of bonus content and will incorporate three all-new entertaining mini movies featuring the cast from SING as well as an exclusive Tori Kelly music video and a variety of musical extras. I love adding a little personal touch to my kids’ Easter baskets. 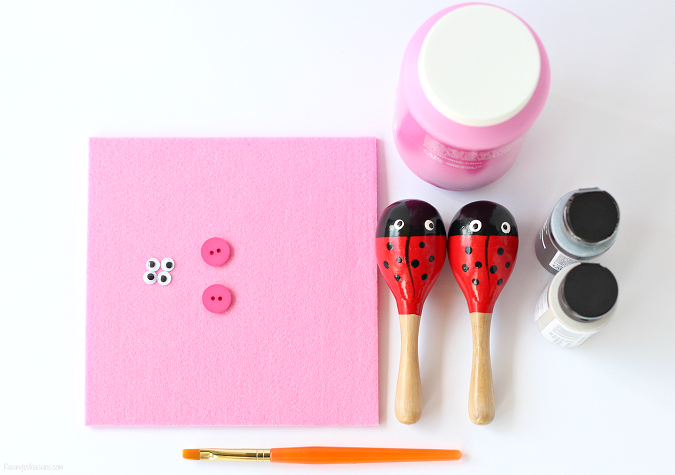 And this year, I’m adding a little crafty inspiration to go along with our SING movie theme. These DIY Pig Maracas featuring Gunter and Rosita make a fun addition to her music inspired Easter basket, and they’re so easy to make. The ladybug design is cute, but we’re looking for some “piggy power” here! 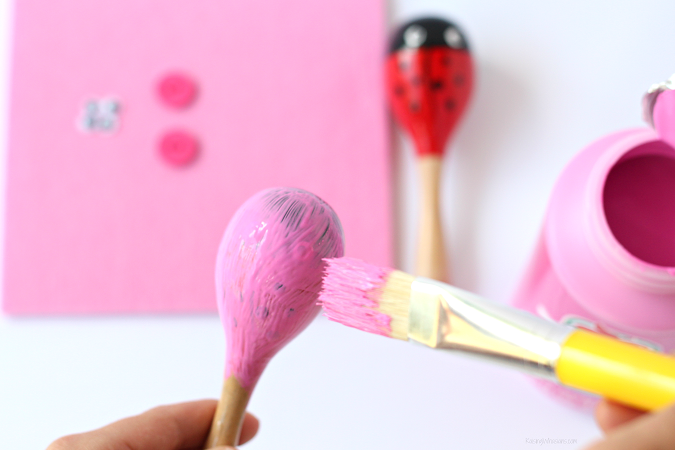 Start by painting the rounded end of the maracas with pink paint. Dry between coats. Gunter and Rosita are known for some pretty glittery wardrobes. So we painted Gunter’s maraca handle in glittery gold paint and Rosita’s in glittery black paint. Allow to dry. 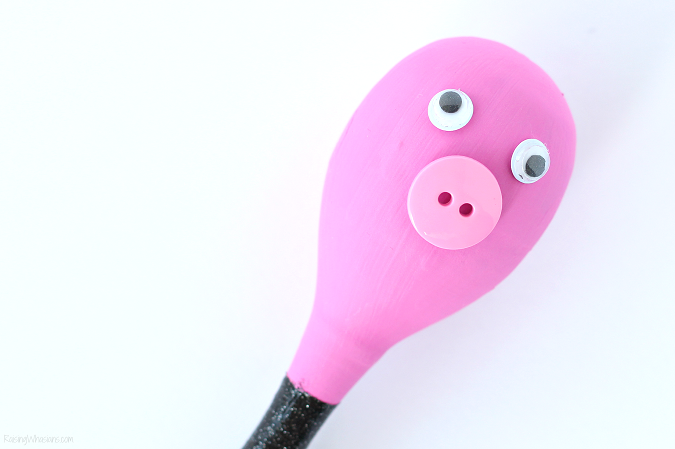 Hot glue two eyes and button nose onto your rounded ends of your maracas to make piggy faces. Can you see Gunter and Rosita yet? OR fold about 2/3 of the way down and glue onto the maracas. We’re done! 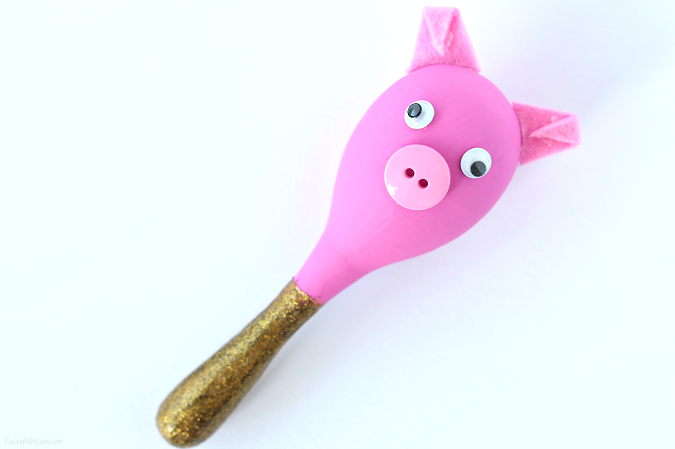 Your child will love shaking things up with these DIY Pig Maracas while watching the new Sing Special Edition on Blu-Ray. Add these DIY Pig Maracas to your preschooler’s SING inspired Easter basket for a shaking, dancing, and singing good time.SING is the musical comedy event of the year! 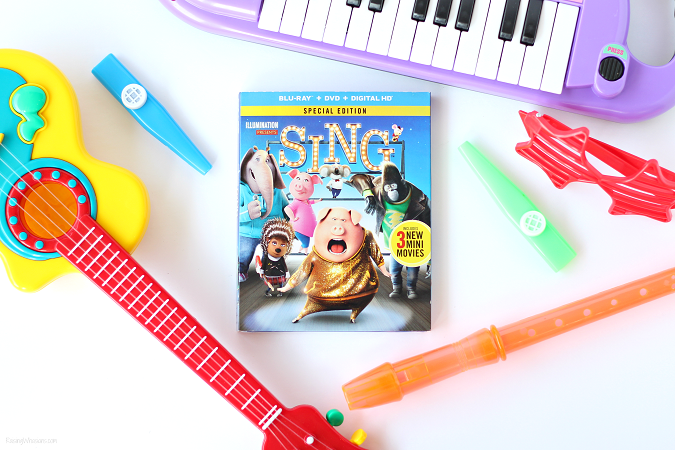 Be sure to pick up a copy of SING Special Edition Blu-Ray, in stores now and the perfect addition to your child’s Easter baskets this holiday season. Follow @SINGMOVIE via Facebook, Twitter and Instagram. Has your family seen the movie, SING? 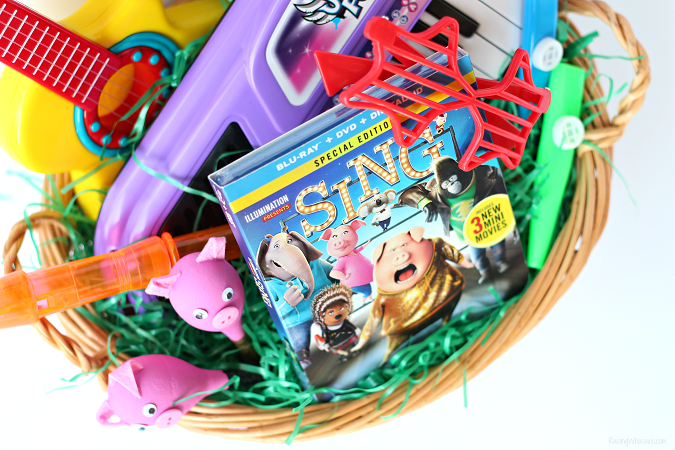 What would you add to this SING movie Easter basket? I loved Sing. We saw it in the theater and loved it. Can’t wait to see it again. Those are the cutest! Little crafts like this are a great way to make movie night even more fun. It really gets the kids into it. I love it. What an adorable Easter basket idea! I remember my kids loved those little maracas when they were at preschool age. This is such an adorable Easter basket idea for a little kiddo. I love it, creative and fun. That SING Movie is quite popular for sure! Aww, I’m loving those cute pig faces! What a fun way to make some music while watching the movie. This is such a fantastic idea! My son really wants to see this movie, and he takes a music class where he always plays the maracas! I would be thrilled if we made some of these together and played while we watched the movie. These pig maracas are so cute. I can’t believe I haven’t even seen Sing yet. A great way to encourage more music in your kid’s lives. Very fun pig. I like these added extras for the Easter basket. It is always nice to see additional content that is not candy! Customizing maracas are a good way of personalizing them according to the latest cartoon or movie that the kids love. The way you made them is so cute! Your crafty maracas are really good any kid would love them especially if they love Sing. Sing has such a great cast I need to get the DVD and watch it with my niece and nephews. So much fun! 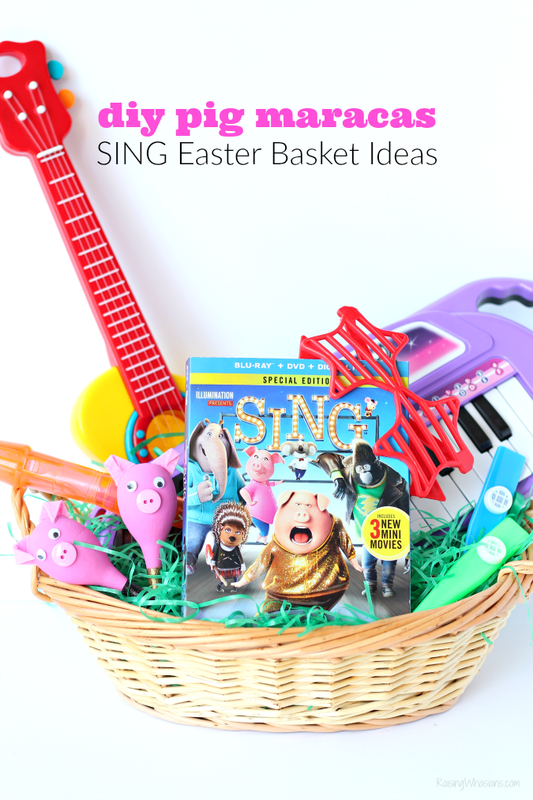 We love SING in our house and i plan to put sing related items in my kiddos baskets this Easter! 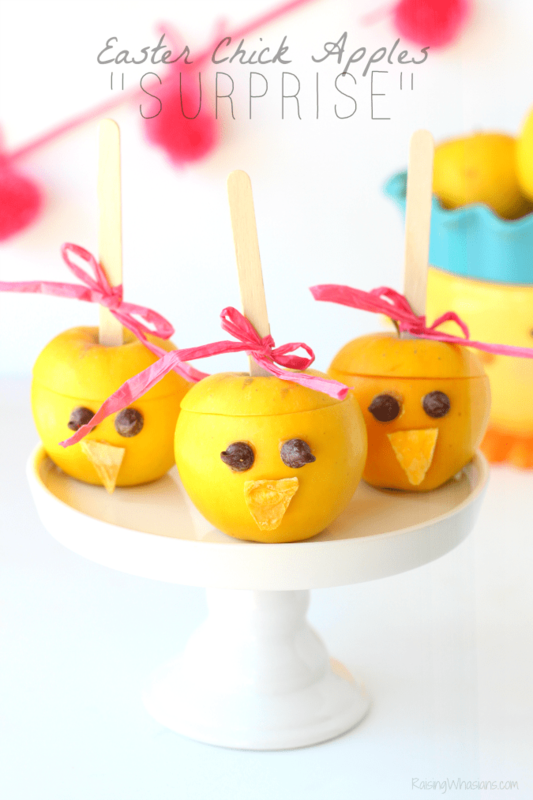 What a fun idea to make your own maracas!! We thought that movie was so cute. It’s going to be in my youngest son’s Easter Basket. We were in love with this movie from the time we saw the first commercial. What a great idea for Easter! I wish my girl was older. I love this movie but the boys in the family don’t so putting it in their baskets wouldn’t go over well. haha! Awwww, I’m not creative when it comes to Easter baskets. This is the perfect idea for my little girl. This really does make the perfect Easter basket for the young music lover. If I didn’t know better, I would have thought you bought those maracas already like that. Sing is a fantastic movie. 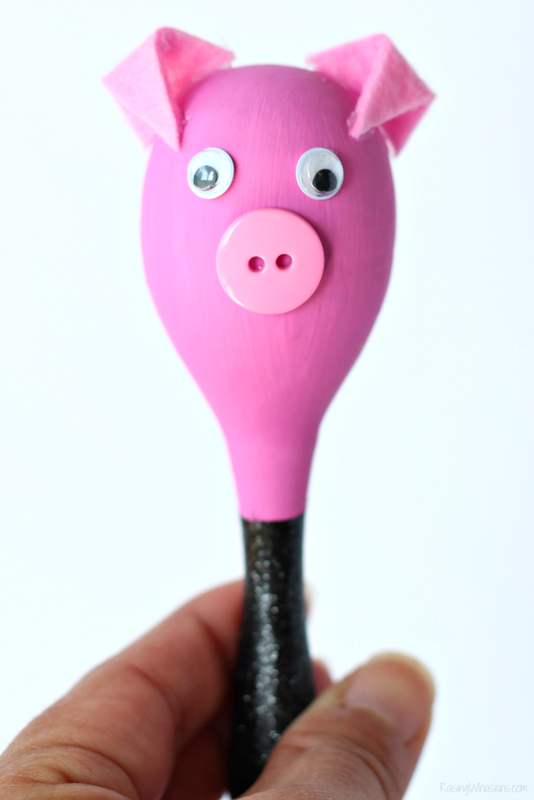 I will have to get the supplies I need to make these pig maracas with the kids this weekend. Your daughter sure loved those pig maracas! I don’t know if I can pull off something like that because I am not really crafty, but I will share this post with my daughter. She can make this for her daughters. Those are the cutest! I loved Song, especially the mama who feels rundown but manages to get her groove. My nieces would love this basket. We love this movie!! Seriously so super cute!! What a great Easter basket idea too!! I love the pig maracas!! Too fun! have been super happy to have received this wonderful basket. This was a fantastic idea for an Easter basket. A great way to substitute music & fun for all that candy that normally fills a basket. Kids need fun things to do, and this certainly will fill that need. Thanks for sharing! We haven’t seen Sing yet, but I’m hoping to see it at the Regal dollar movies this summer! A friend highly recommended it for my kids because they love music!